The Sounds (FB / TW) performing Song With A Mission at The Observatory in Santa Ana, CA. Filmed on October 23, 2013. Legos – we all grew up with it, and while it has largely remained a toy for children, it has captivated our hearts so much that we can still enjoy it as adults. Thankfully, the world has Lego expos and conventions for those still young at heart, such as at Bricks LA 2017, a Lego exhibit. Taking place at the Pasadena Conference Center this Saturday and Sunday from 10am to 5pm on both days, this exhibit for all things Legos contains multiple aisles of carefully curated works of art constructed with Lego pieces. Visitors pay a simple admission of $10 to gain access to a floor full of Lego sculptures, landscapes, artwork, Lego machines, and more. While visitors may interact with the master builders behind some of these works, most of the tables generally have the Lego artworks with no one else around to inquire about the work. The center of the floor primarily contains Lego art on display, while the outer areas have other things. Bricks LA generally places all of the vendors, most of which sell Lego sets and other paraphernalia, on one side of the floor. The front area usually has some of the interactive demos, such as train tracks and a conveyor system that resembles a Rube Goldberg machine. If you love Legos and/or art in general, you owe it to yourself to check out Bricks LA some time this weekend. Give Bricks LA a like on Facebook and a follow on Twitter. 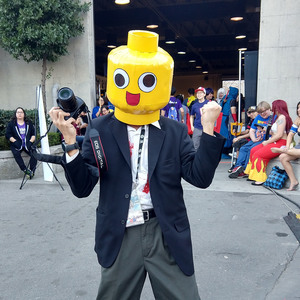 For an event centered on toys, Bricks LA does not always have a bunch of crazy children running amok, as visitors consist mostly of young adults rather than children. Sure you could see everything in less than an hour, but at that low admission price, Bricks LA makes for a fun activity that anyone can enjoy, and it also makes for an awesome photo collection. The Mad Caddies (FB / TW) performing Silence at The Observatory in Santa Ana, CA. Filmed on October 24, 2013. Orange County surely has their true fair share of craft beer fanatics that pledge allegiance to the top few local breweries. While craft beer in general encourages people to try new things, the highly conservative Orange County prefers to stick to their guns, opting only to give their loyalty to the best. Orange County has no room to try new things – they only want familiar things, especially in their beers. Perhaps this leads to the reason for high barriers to entry for a microbrewery to grow in Orange County. When people only want the most popular breweries, then the separation grows, much like the division between the poor and the wealthy. On the other hand, the number of popular breweries rises steadily, expanding from the original elite few to a handful of great breweries, which now includes Chapman Crafted Beer. With Old Orange Brewing going through some strange unknown times (allegedly a bigger brewery bought them out), Old Towne Orange has returned to the craft beer spotlight with Chapman Crafted Beer. Chapman Crafted has existed for over a year by now, but took some time to get the ball rolling; however, do not call them beginners by any stretch. You see, the folks behind Chapman Crafted have a huge history in Orange because they derived from the Haven Collective. They started as just a gastropub in Orange, then expanded to a brewpub in Pasadena, and then acquired the Provisions Market down the street in Orange from The Bruery. They eventually closed down their operations in Pasadena, opting to focus on their home scene, which led to the founding of Chapman Crafted. In other words, these guys already know how to operate a brewery – think of it as them moving operations from Pasadena to Orange. As such, one can expect the same great quality of local beers as before from the variety of beer styles offered. Check out Chapman Crafted Beer in Old Towne Orange and enjoy a brew or two there, or take some beer to-go. Check out what else Chapman Crafted Beer has coming up by liking them on Facebook and following them on Twitter.